More than 100 visitors have attended an inspiring Careers Expo at Nelson and Colne College – designed to help raise awareness of Apprenticeship, volunteering, Traineeship and work placement opportunities. The Expo gave school and college leavers, job seekers or individuals looking for a career change the chance to speak to employers and Apprentices across a wide range of sectors, and view live Apprenticeship vacancies. 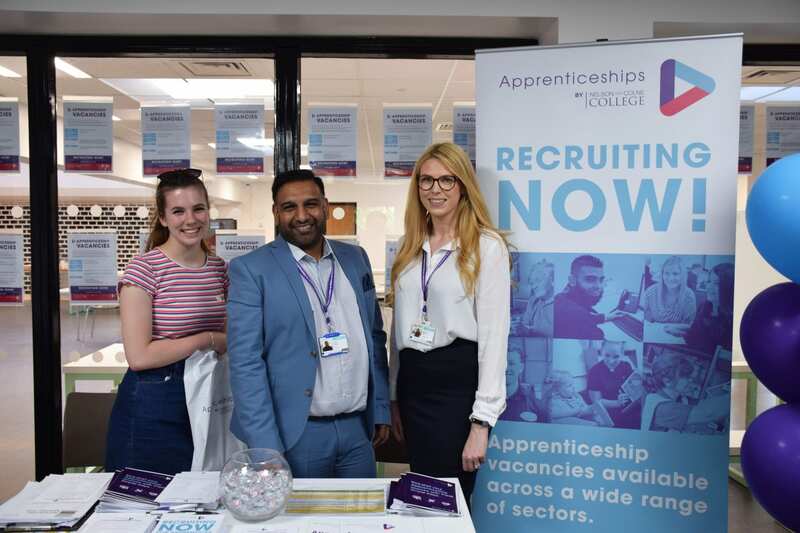 Expert members of staff from the college’s Apprenticeship Team, Careers Team and University Centre were on hand to provide high quality careers advice and guidance, as well as further information on progression routes to higher education. More than 30 businesses from a broad selection of employment sectors such as Business and Professional Services, Catering and Hospitality, Childcare, Creative and Digital, Engineering, Health and Social Care and Information Technology were there on the night, as well as Burnley FC in the Community who offered information on a new Traineeship programme that will be delivered in partnership with Nelson and Colne College. One of the employers who found the event a success was Suzanne Winslow, Group Apprenticeship Manager at Daisy Communications. She said: “We’re offering some of our entry level positions now as Apprenticeships, which we have never done before and it is an exciting time for us. Nelson and Colne College A Level English Language, French and Geography student Emily Shapland, 17, said: “I came to the Expo to see the variety of businesses in attendance offering Apprenticeships. Leah Woods, 17, from Colne was also attending, and said: “I really enjoy working with people so I was looking for an Apprenticeship in customer services with any of the companies present. Nelson and Colne College is the top performing general FE college nationally for overall Apprenticeship achievement, at all ages and levels, according to the government figures, and is also number one for 16-18 timely Apprenticeship achievement, at all levels.